Williams Refrigeration and Heating provides sales and repairs on both standard tank type water heaters and the highly efficient tankless water heaters. We sell water heaters at up front and affordable prices. 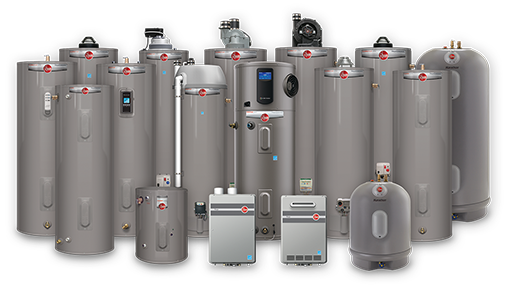 As well as using only the Rheem gas, electric and tankless water heaters, we only use professional quality replacement parts for repairs and guarantee our workmanship and products. Most traditional water heaters maintain a large amount of water at a constant heated temperature stored in a holding tank. This consumes a great deal of energy during periods of time when you don't need hot water. Tankless water heaters go into action the moment you require hot water, which is heated instantly as it travels through the tankless water heaters heating system, being delivered continuously and on demand only when you need it. Since it only consumes energy when being actively used, it saves you on your home energy costs and is an environmentally friendly option for your home. A tankless water heater is able to heat water on demand, the hot water never runs out. Tankless systems are usually good solutions for homes with a tub or spa or pool. Especially large families, or bigger homes with higher hot water demands. If you currently have a 46 gallon or higher gallon tank and plan to upgrade, we strongly suggest that you consider the Tankless Water Heater as an option. A service technician from Williams is happy to come out, provide an inspection, and let you know the costs associated with installation of a new tankless water system for your home or business. You will have gallons of hot water available with the turn of your faucet. Tankless water heaters offer limitless supply of hot water when compared to the capacity of conventional tanked water heaters because with a traditional water heater once your out of hot water, you have to wait for the whole tank to reheat. With a tankless water heater, the water is heated instantly when needed. Tankless water heaters are sized based on flow rate and usage of hot water in a home. Our friendly technicians will be able to size the perfect tankless for your home so you will have endless hot water. Our main focus is you, our customer. We are not happy until you are happy, our continued success is dependent upon your satisfaction, therefore it is the main focus of our business. We strive to provide superior customer service, a superior product all at an affordable price. Copyright © 2018 Williams Refrigeration. All rights reserved.